The Industrial Workers of the World could help shape the future of SEIU's Fight for 15 campaign — making it more democratic and worker-centered. Insomnia Cookies has more than 30 branches nationwide. The chain specializes in delivering cookies and milk in areas with large college-student populations. Its busiest times are between midnight and 2:45 a.m., when students have returned from a night out and are willing to pay a premium for Insomnia’s treats to be delivered to their dorm rooms. Peña and the other striking workers have filed charges with the National Labor Relations Board and have charges pending with the Attorney General’s office. They are alleging compensation below minimum wage, shifts longer than eight hours with no federally-mandated hour-long break, expectations of working after clocking out and a myriad of other breaches of labor law. While Jonathan was working for Insomnia, a delivery biker, under tremendous pressure to do as many runs as possible, was hit by a car. A baker at Insomnia makes $9 per hour and is expected to bake cookies, serve ice cream, take out the trash, work the cash register, clean the entire store and make bank deposits after closing. Night-shift workers are paid only until 3:30 a.m., even though they are required to make bank deposits after being clocked out. Peña spoke of once having to work past 5 a.m., despite only getting paid until 3:30. Delivery bikers earn only $5 per hour, plus 50 cents per delivery and tips. None of these workers are eligible for health care benefits. The four striking workers are demanding the right to form a union without intimidation from management, a raise to $12 per hour and access to benefits, including health care. Two things happened within hours of the initial strike and walk-out. First, all four workers were fired. Second, they decided to enlist the help of a labor union, the Boston branch of the Industrial Workers of the World, often known as the Wobblies. The IWW, founded in 1905, is perhaps the most radical labor union in the United States. Its support for workplace democracy, direct action and its slogan “an injury to one is an injury to all” have largely defined anarchist and socialist labor organizing in this country for the last century. Among the largest active branches in the United States, Boston’s Wobblies were chosen to host the 2013 IWW Organizing Summit. The union often engages in solidarity actions with non-unionized workers, making it an ideal partner for the Insomnia Cookies workers. Soon, the Wobblies got to work providing support where they could. They organized a half-dozen pickets in front of the Insomnia Cookies store in the past month, distributed fliers in the Harvard Square area and reached out to various organizations in the Boston area that might be friendly to the strike. Two of the striking workers accepted the union’s offer for “organizer training,” receiving a crash course in labor action and workplace organizing. But the Wobblies have also made a priority of empowering the striking workers themselves, not co-opting and taking over their campaign from them. The strike comes at a time when the Fight for 15 campaign in fast-food restaurants, organized in large part by the Service Employees International Union, is receiving national media attention. But in many respects the campaigns couldn’t be more different. The SEIU is a large bureaucracy with a top-down organizing style. Some in the labor movement refer to it with disdain as the quintessential “bosses’ union,” allowing the interests of management to come before those of the workers the union is supposed to represent. In spite of the widespread sympathy aroused by the fast-food walkouts, some observers are nervous about the SEIU’s role in the ongoing struggle of fast food workers to achieve a living wage. The IWW’s approach is hardly without its limitations, however. Wobblies only became involved in the Insomnia Cookies struggle after being reached out to by one of the striking workers; if that worker hadn’t known about the IWW already, the union would never have become involved. At the Boston IWW’s organizing meetings for the Insomnia campaign, one finds a sea of white, male faces — a lack of diversity that tends not to be the case at an SEIU rally or meeting. Additionally, lacking the SEIU’s financial resources, it’s hard to see how this now-tiny labor union could have anywhere near the impact of the larger, more bureaucratic unions. Through careful agitation, however, the IWW could help shape the future of the Fight for 15 campaign. 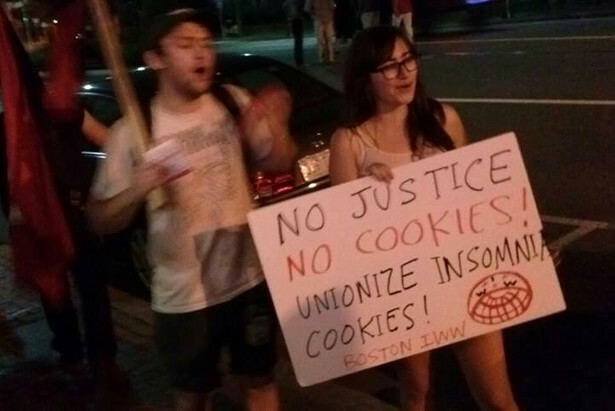 A nationwide mobilization against Insomnia Cookies branches is certainly within the capacity of the union, which has waged struggles against much larger chains like Starbucks and Jimmy John’s in recent years. A successful, worker-led campaign against Insomnia could garner enough attention and prestige to compel unions like the SEIU to be more transparent and democratic in its struggle against multinational chains with millions of employees. The Fight for 15 campaign is one of the most encouraging developments in the U.S. labor movement in recent years. If the IWW is able to contribute to this effort in a real way — infusing it with concepts like workplace democracy, worker self-management and direct action — the winners will be low-wage workers everywhere. I don’t like top-down unions, they are just a little better than companies with a top-down organization. And after attending an IWW meeting, I was very impressed but I have one reservation. That reservation is I senses that they can sometimes be tribalistic. But it is definitely beneficial to go and to learn. Thanks for the great article. Many Wobblies here in Madison,WI are involved in the low wage workers campaign, but we constantly have to remind our allies that SEIU was hardly the first union to organize such workers! Below is the text of the solidarity flyer we’re using here. For the OBU! Give Us Bread, But Give Us Roses Too! Next Time You Eat, Think About the Workers Behind the Food! Many people don’t realize it, but some of the worst paying jobs in America are found in the food/farm sector – from family farmers who often qualify for food stamps and have about as much autonomy as medieval serfs to undocumented migrant farm workers facing exploitation and deportation at the ruthless hands of agribusiness; from increasingly non unionized workers in food processing and meat packing plants with no healthcare or job security to the throw away minimum wage part-timers who stock the shelves at big box retailers and prepare the drinks and meals for fast food chains. Yet, what are the true costs of this “cheap” food policy? Let’s name a few: billion dollar taxpayer subsidies lining the pockets of the food giants (Kraft, Cargill, McDonalds, Walmart all made record profits during a global economic recession); runaway food contamination killing unwitting consumers (including 20,000 dogs and cats who died from imported pet food laced with toxic melamine); escalating rates of junk food induced obesity and Type II diabetes (U.S. born children of recent immigrants now live shorter lives than their parents), horrific animal abuse on factory farms, manure runoff, and biotech pollution threatening our air, water, soil, and wildlife (even bees are now facing extinction due to reckless agrochemical spraying); farmers losing their livelihoods through bank foreclosure, land grabbing, and commodity speculation (a Swiss hedge fund just gobbled up 9800 acres of farmland in WI for $68 million); toxic exposure for farm workers in the fields and grisly injury on the assembly line (amputations for workers at Palermo’s Pizza in Milwaukee). Thankfully, there is a now a grassroots movement afoot to win a living wage, justice on the job, and human dignity for low wage food/farm workers all across the U.S. Even though they are often not (yet) part of a union, workers are so fed up that they are going out on strike at fast food chains and big box retailers across the country – and they have lots of community support! One union that has always been a supporter of such labor struggles is the Industrial Workers of the World (IWW). Founded over a century ago – in 1905 in Chicago to be exact – the IWW was the first union in the world to ever organize low wage workers across ALL economic sectors – including immigrants, farm workers, prisoners, women, LGBTQ folks, the differently abled, as well as people of color. Some famous IWW members (or Wobblies) you may have heard about include: Elizabeth Gurley Flynn, Frank Little, Marie Equi, Joe Hill, Ralph Chaplin, Helen Keller, Lucy Parsons, Big Bill Haywood, Ben Fletcher, Covington Hall, Manuel Rey, Utah Phillips, Carlos Cortez, and Judi Bari, to name but a few. In 1912 the IWW led the famous “Bread and Roses” strike by sweatshop textile workers in Lawrence, MA, as well as many early 20th century strikes by miners and lumberjacks in the Pacific Northwest, as well as in MN, WI, and MI. By 1917 the IWW had also organized over 100,000 migrant farm workers across the Midwest through the Agricultural Workers Organization (AWO). This legacy continues today with recent IWW organizing among warehouse workers in New York City and short haul truck drivers in California, as well pioneering IWW drives to unionize workers at national fast food chains like Starbucks and Jimmy Johns. You can find out more on these efforts at: http://www.jimmyjohnsworkers.org and http://www.starbucksunion.org. Wobblies are also involved in supporting migrant farm workers from Oaxaca who have recently launched a campaign against Sakuma Brothers over abusive conditions in the berry fields of Oregon. Closer to home, Wobblies were also involved in the first ever union drive at Whole Foods in Madison in 2002 which – unfortunately – did not stick as Whole Foods CEO, John Mackay (who once compared unions to herpes), retaliated by sacking union organizers and launching a vicious union-busting campaign. When Tyson tried to bust the union at the largest pepperoni maker in the U.S. in Jefferson, WI in 2003, the IWW once again joined the picket line and helped organize consumer boycotts of “scaberoni.” Madison Wobblies were among the 5000+ peaceful protesters who got pepper sprayed by riot police in 2004 in Decatur, IL for supporting the locked out workers at the A.E. Staley corn syrup plant. The Madison IWW also helped organize locally for the Coalition of Immokalee Workers (CIW) in their efforts to win justice for FL tomato pickers from fast food chains and big box retailers like Taco Bell and Trader Joes. This legacy of solidarity has continued with staunch IWW support of workers at Palermo’s Pizza in Milwaukee who have been out on strike since June 2012. What do food/farm workers deserve? ALL workers deserve dignity and fairness – including those who cultivate, process, distribute, and prepare our food. We want to increase our wages to $15 an hour, a wage we can live on. We also want basic workplace benefits – sick leave and health care, for example. We are organizing because if you work 40+ hours per week – often at multiple part-time jobs – you should not be condemned to a life of poverty, abuse, and insecurity. EVERYONE deserves the right to be able to earn enough to support themselves and their family, especially when agribusiness executives and corporate shareholders are raking in billions in profits and dividends. And just because a worker receives lower wages, travels around for seasonal work, or is hired part-time does not mean the person can’t organize and belong to a union. Once you realize you are part of a larger struggle it is easy to see the value of joining the One Big Union! The IWW has been – and always will be – a fighting rank and file union that relies on direct action tactics on the job to secure workers’ rights. We CAN dump the boss off our back and reclaim the fruits of our labor to better our lives and those of our families and communities. This means organizing TOGETHER, though, to take on the food giants, and not letting them pit us against one another. If you are what you eat, then working class solidarity across the entire food/farm system needs to be the first item on everyone’s menu. Are you hungry enough for real change? Thanks for posting this, John–it’s great.